Providing its guests with a true contemporary hotel decor, the 37 -story Pan Pacific Singapore is sure to impress. 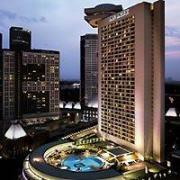 Found in Marina Bay of Singapore , Pan Pacific Singapore is ideal for business travelers. The 37 -story Pan Pacific Singapore has recently undergone major renovations to both guestrooms and public areas. Location: Pan Pacific Singapore Hotel, with its proximity to the Central Business District, is located in the heart of Marina Bay, a shopping haven of over 500 shops and restaurants near the Singapore River. The Pan Pacific Singapore Hotel offers direct access to the Singapore International Convention and Exhibition Centre via a sky bridge. In fact, this luxury hotel in the heart of Singapore, is walking distance from many historic landmarks, such as the Padang, stage to some of the most significant national events, the Cenotaph and the commemorative landing site of Sir Stamford Raffles - founder of modern Singapore.